Thought I’d let you know that I am signing books at Barnes and Noble on Dec 9 in Reno, NV. I asked the rep to order your book as well. It wasn’t up on Ingram yet but hope it will be in time. BTW, bet you didn’t know I played violin all through school and was in the High School Orchestra. Also my one grandson played violin before switching to trumpet. He was really good. I sucked. Suzanne was right your site is gorgeous. I, like MJ played violin and cello for my school and was in an orchestra – how cool is that. You books look great! I wish you many sales. We met today at Madame Francine’s and it was wonderful to hear of your violin books! Your blog is a fantastic resource as well. How fantastic that someone is focusing on children’s books related to learning the violin! Thanks so much for sharing your talents! We’ll be ordering soon! 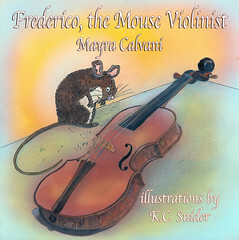 Learn the parts of the violin with Frederico, the Mouse Violinist. Now from Guardian Angel Publishing! 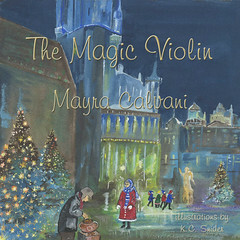 A little girl learns the mysterious power of self esteem in this children’s story which combines violin music, magic, Christmas, and the charm of Europe. Now on Amazon, B&N, and from your local bookstore! I receive review copies from authors, publishers and publicists. Except for the review copies, I don't receive any type of monetary/gift compensation for my reviews. Want me to review your book? Send me an email at mayra DOT calvani AT gmail DOT com.